Updated Monday June 11, 2018 by Grayslake Colts Football, Cheer & Poms. On behalf of the Board of Directors, we would like to welcome you to the Grayslake Colts Football, Cheer & Dance website. 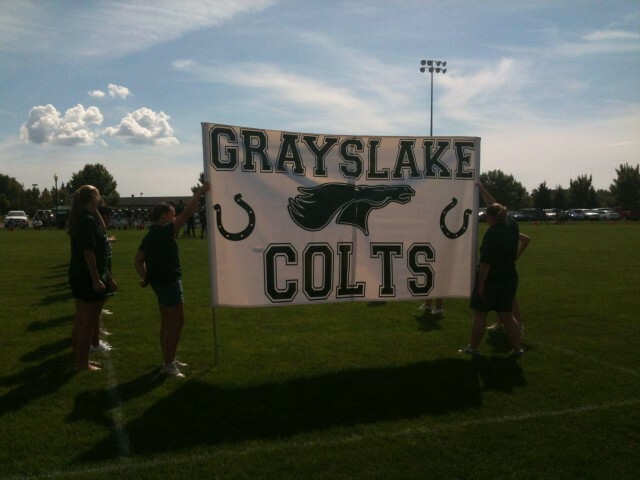 The Colts are Grayslake's original and oldest tackle football, cheerleading and dance instruction organization supporting athletes in future high school district 127 since 1968. We are a proud affiliate of the Grayslake Park District, one of the founding member communities in the TCYFL, and a member of the IRCA. Our mission is simple - we are a youth travel program that supports our athletes with guidance, instruction, coaching, mentoring, uniforms and equipment that provide the utmost safety; instilling at all times a spirit of good sportsmanship while acting with honor and integrity. As an affiliate of the Grayslake Park District we practice and play all of our home games at Aquatic Field, also utilizing our partner high schools of Grayslake Central and Grayslake North. Our football team plays in the TCYFL (The Chicagoland Youth Football League) the largest and most competitive league in Northern Illinois. We are in good company with 40+ member communities in the Chicagoland area. We will field multiple teams at different age and weight groups, providing our athletes the opportunity to compete against some of the best talent in the area, while developing skills that will allow them to be competitive players at the high school level. All of our coaches are thoroughly background checked, PCA certified and have completed USA Football Heads-Up certification training & advanced concussion training, ensuring your athletes are learning to play the game correctly and safely. Athletic trainers are on-site for all football games to assist in any potential injury situations and providing another level of care and safety for our players. Our cheer and dance teams are members of the IRCA (Illinois Recreational Cheer Association), the largest cheer & dance association in Illinois. Athletes are placed on teams in accordance with cheer or dance and their grade in school for the upcoming fall season. In addition to cheering and performing at football games, our teams compete throughout the year at various venues within neighboring communities for the opportunity to win a bid to the annual State Competition in early December. Through instruction, practice and competition, our athletes learn skills which develop them in the areas of technique, sportsmanship and responsibility, and prepare them for success at the high school level. We are a volunteer organization that is dependent upon parent participation in order to be successful. We strive to keep our registration fees as low as possible while continuing to offer the best and safest equipment, uniforms, fields and developmental opportunities available. To do this, in addition to fundraising throughout the season, we also accept business and personal Sponsors who help us maintain our excellent program delivery while helping us to sustain the organization for future generations. If you are interested in Sponsorship opportunities, please visit our Sponsor tab for more information. We invite you to explore our site and should you have any additional questions, please reach out to us at info@grayslakecolts.org. ALL physical items ordered may be picked up at the field or will be delivered by a coach, team coordinator, or board member unless otherwise noted on the order form. We do NOT offer any shipping options at this time. The Grayslake Colts Football, Cheer & Dance Association is a 501C3 Corporation located in The State of Illinois, United States of America.